We finally got off the dock! Weather seemed to line up just so, with forecasters predicting heavy lightning storms for the INTERIOR of Florida including Lake Okeechobee (of course). Once underway The Gulf Stream was annoying as usual but the ocean was fairly mild in the wave department. We had a beautiful dinner at sea and we were thrilled to be on our way. Then we started our usual night watch program around 8ish – 2 hours on, 2 hours off (sleeping). The sky that night was beautiful but also a little foreboding. When you sail you become VERY sensitive to weather. Especially clouds. Clouds can tell you things about upcoming weather. We thought these clouds were confirming the storms heading to Florida, because even though they looked pretty they had formations that spoke of less favorable conditions in the near future. Since we were sailing away from them we didn’t really worry. Well something changed and we had a new not so pretty cloud coming up on us. 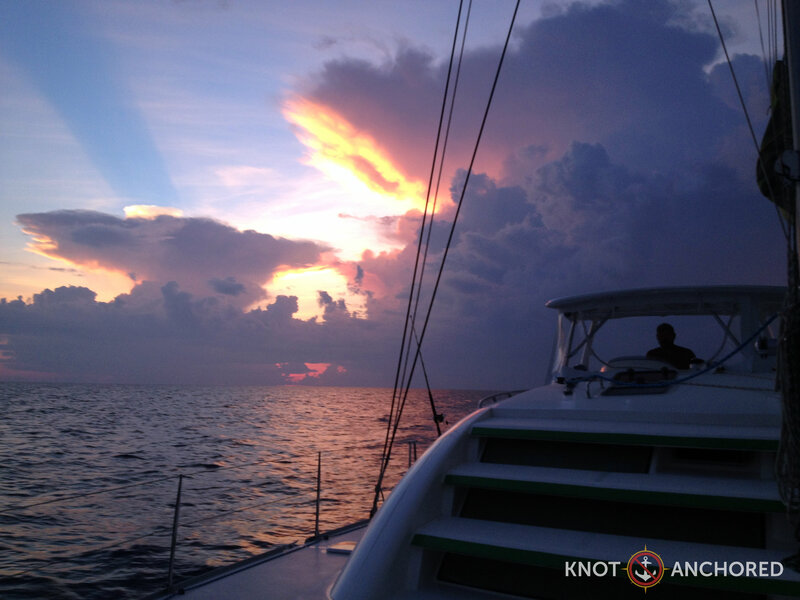 We set course for the Bimini Islands, thinking we could not out run this cloud. So we just kept going figuring she would move over and away from us or we would get away in time. She caught us in the open ocean, sails up. 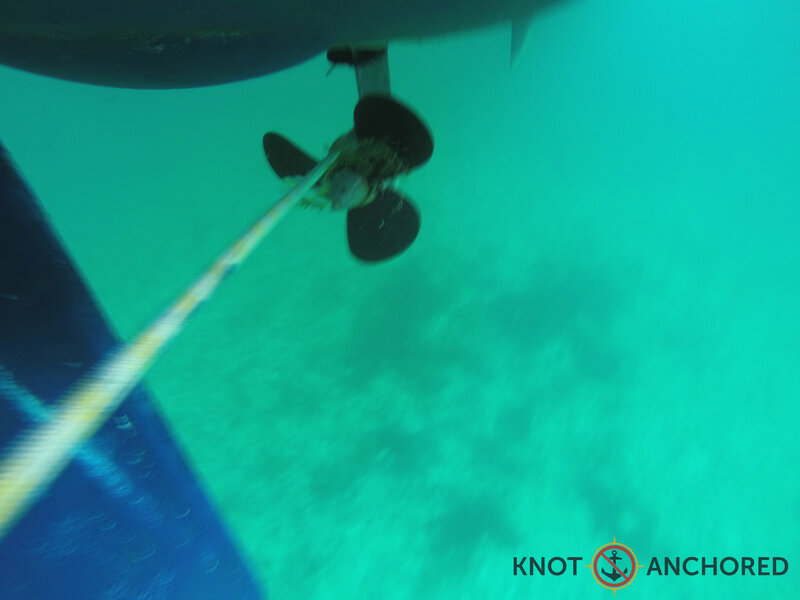 – one jib genoa line let go (damn you bowline knot)! And here’s the biggy – both new custom trampoline cushions unsnapped. One flew off the bow with a bumper. We knew better then to leave the safety of the helm to retrieve it in those conditions. Then the other flew back towards the helm as we slow motioned the word ‘nooooooo’ and bounced off the back never to be seen again. It was so close – and yet not really. We had our hands full and were slightly disabled running on only one engine. The sails were our biggest issue. We needed them down – fast. Not so easily done in 40 knot winds. The storm came about like this, dark cloud, lightening and then one really cold breeze that made Steve and I look at each other like “did you feel that”? It was gone as quickly as it came but thinking back we probably should have put our sails down right then. But we didn’t and then the wind meter started to climb – FAST. Ideal sail conditions are around 15 knots, after 30 you shouldn’t have any sails up at all. So as you can imagine it’s pretty darn bad to have em up in 40 knots. Hey we tried to beat the wind but the line came off the genoa (forward sail), so we only had one holding on. If that wasn’t a big enough distraction the starboard engine stopping was, due to a rope wrapped around the prop. Our only good engine had a battery light that came on. This was a yoga ‘Be in the Present’ moment if I’ve ever seen one. We look at this as our donation to Mother Nature. All in all we came through it, learned a lot and found out that we truly do work well as a team in ANY situation! Next Chubb Cay – Making Lemonade!